The Association of Brass Band Adjudicators is sad to announce the death of member Stuart Fawcett. 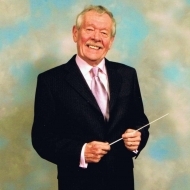 Stuart commenced his musical career as a cornet player with Meltham and Meltham Mills Band at 8 years of age, and after moving onto euphonium, in 1962 was invited to join Crossley Carpet Works Band in the Championship section. In 1965 he enlisted into the Band of H M Coldstream Guards where he served for 12 years, moving onto Trombone whilst being promoted to Sergeant. Stuart then emigrated to Australia where he was appointed Head of Brass and Director of Bands at a prestigious Grammar School in Brisbane. During his 13 years in Brisbane he enjoyed many major contest successes with the Sunnybank Band, and was also a Warrant Officer Bandmaster in the Australian Army. In 1985 H M the Queen awarded him the Order of Australia Medal for his services to music in Queensland. On his return to the U.K in 1989, after a short spell conducting Jayess Brass he was appointed M D of Skelmanthorpe Band, and during his 10 year stay helped steer them from Third to Championship Section in 2000, before returning to Meltham as Musical Director of his first village band. In conjunction with the NABBC, he studied for the Licentiate Diploma in Brass Band Adjudication through Salford University, and was awarded the Diploma in 2003. The Area contest at Bradford in 2010 proved to be one of the highest achievements for Meltham Band in it’s long history as Stuart guided them to the Yorkshire Area 1st. Section Champions, and subsequent promotion to the Championship Section.